It’s hard to think of many businesses today that don’t have at least some Internet marketing component to what they do. For most, a big part of that effort to find new buyers over the web will involve search engine marketing, the process of trying to improve a business website’s ranking on Google, Yahoo, and Bing for the keywords and search terms that customers use most frequently. Because the search engine marketing process tends to be long, tedious, and occasionally expensive, some business owners and managers try to avoid the issue by ignoring search engines altogether. We urge you to avoid making that mistake. Not only is search engine optimization and marketing not going away anytime soon, it’s likely to become even more important over the next few years. The reason is simple: Customers like to find products and vendors online, and search engines are the overwhelmingly favorite first stop on the Internet. Consider that Google, which receives the lion’s share of search traffic, processes more than 2 billion search requests each day, and you can easily see why it’s imperative that buyers be able to find your company on the first couple of pages. Optimizing your site for search isn’t just a good online marketing strategy, it’s necessary just to stay competitive. Fortunately, it doesn’t have to be the painstaking process that many people think it is. Here is a checklist for on-page SEO. And below that we’ve added a new search engine infographic that dissects Search Engines, their uses, and their effects. 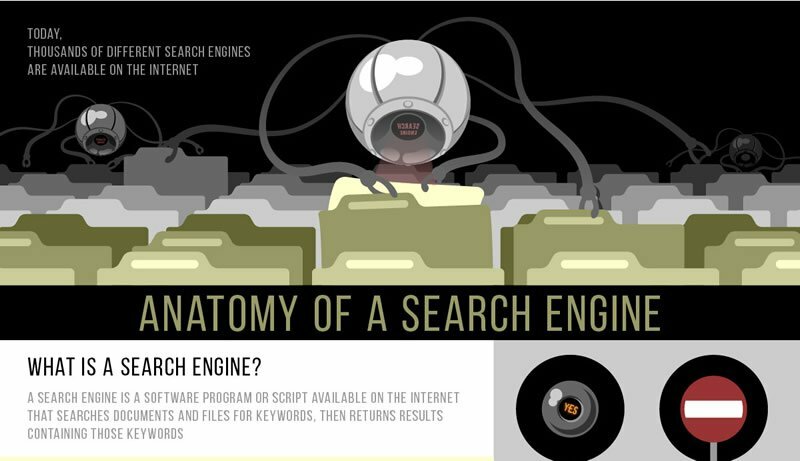 Anatomy of a Search Engine – Infographic was created by First Site Guide Team.